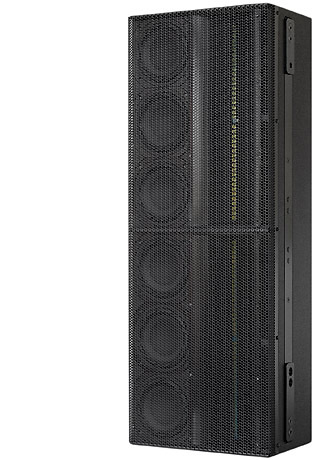 The QR36 is a modular 2-way column loudspeaker to be used as vertical array, either in stacked or flown configuration, for both permanent and (limited) portable installations. It combines the ease-of-use handling of a conventional system, with the throw of a line-array system. As an “array of line-sources”, a QR system acts as true cylindrical radiator, offering a 3dB SPL drop-off per doubling of distance (in the “near-field” or “Fresnel-zone”). This brings significant advantages in SPL coverage and (intelligibility) throw, from a relatively simple system. Featuring double RBN1801 pro-ribbon drivers (patents pending), the QR36 offers Real-90 horizontal dispersion with seamless coverage; Its transient response and high peak power handling enable an amazing intelligibility and throw. The 91% active frontal radiation, in combination with the ribbon’s all-natural cylindrical flat (Isophasic) wavefront, brings maximum “gainbefore- feedback” up to directly in front of / under the cabinet. The Signal Integrity Sensing™ pre-wiring ensures complete cable/connector compensation between the QR36 and ALC. In this way, the ALC can be loaded down to 2 ohms, without any sacrifice on response quality (2 units QR36 parallel on one channel loads 3 ohms). The system includes dedicated filtering, but system equalizing is done remotely (electronically) fully utilizing the individual speaker components’ power capacity; In combination with the unusual high peak power handling (6000W/200mS), this results in a virtually infinite headroom SPL from 1kHz.up. Typical applications for the QR-systems include main system for theatre, PA system in “acoustically challenging rooms”, as well as high power side-fill stage monitoring. For full system performance, the QR36 needs to be driven by an ALC controller-amplifier. Driven by the ALC, the QR36 delivers maximum sound quality with inaudible (power and excursion) protection (SDP circuit).